There has been a change in ideological sentiment on China’s involvement in Africa. The paradigm shift has been led by Zambian economist Dambisa Moyo’s bestseller, Dead Aid, which gave voice to the possibility of a development model defined by diligent business practices as opposed to the traditional Western model which is driven by foreign aid. If managed prudently the Sino- African relationship could prove to be an empowering change for several African governments and provide the foundation for the continent to take its place as a partner in the global economy. For China, Africa is an excellent complement to its resource and market-seeking global agenda. Since 2000 China-Africa trade has grown at an average annual rate of 33.5 per cent. Although still second to the United States (whose trade with Africa amounted to US$140 billion in 2008), trade rose from US$55 billion in 2006 to around US$107 billion in 2008, accounting for 4.5 per cent of China’s total trade and surpassing the US$100 billion trade target set for 2010 at the 2006 Forum on China- Africa Cooperation (FOCAC). In the global financial crisis, what people tend to easily ignore is the implementation of the Millennium Development Goals … Here I would like to once again appeal to the international community to work hard with firm determination and effective measures to reach the MDGs while tackling the global financial crisis. This declaration was accompanied by the announcement of US$10 billion in preferential loans to support African countries over the next three years. In light of the OECD’s prediction that the G8 will fall US$23 billion short of its 2005 promise of US$50 billion in foreign aid to the poorest and most vulnerable by 2010 (Africa contains 33 of the 49 Least Developed Countries, as classified by the UN ), it is little wonder China’s diplomacy is gaining traction among African governments. Although the China-induced resource boom is providing a shortterm fillip to African growth and Moyo’s ambitions for a business-driven model of growth, China alone will not be the continent’s saviour. To avoid destructive competition in the region, a cooperative framework on African issues is required between China, the US and Europe and emerging partners to the continent such as Brazil, India and Russia. This is increasingly important in the context of trade frictions that are present in the current global economic environment. Legitimate concerns about human rights and exploitative practices surround China’s non-interference based involvement in African nations. The list includes arms dealing with repressive regimes, support for autocratic governments isolated by the West, plundering resources with little concern for environmental issues and importing unskilled Chinese labour who are culturally ignorant and unwilling to integrate. Many of these issues highlight what seem to be self-serving political and strategic motives behind China’s activity in Africa. Many are fuelled by Western hypocrisy. The West’s involvement on the continent has been, and continues to be, littered with tales of mismanagement, exploitation and funding despots. Furthermore, China is hardly alone in marrying political and strategic considerations to its aid agenda. In December last year the US President, Barack Obama, signed off on a deal with Israel worth US$2.77 billion in 2010 (worth a total of US$30 billion over the next decade) with 75 per cent tied to the purchase of US-made military hardware. Defending exploitative behaviour is not the issue. The business-driven model of development provides new opportunities to several African nations long overlooked as legitimate trading and investment partners. African countries and the African Union need coherent, longterm strategies to apply leverage to international commercial interests and to create opportunities for enduring economic competitiveness and growth. With the prediction by the International Energy Agency that China’s oil imports will increase four-fold by 2030, it is vital for Africa itself to respond strategically to the opportunity that China offers the continent. Although the FOCAC provides an effective forum to develop diplomatic and commercial relations, the issues cited above will continue to bedevil China’s involvement with the continent if strong institutional frameworks of governance and dispute resolution mechanisms are not properly implemented. In the latest issue of The Atlantic magazine, China’s resource play in Africa and development pledges are discussed in vivid detail and questions are asked. All across Africa, new tracks are being laid, highways built,ports deepened, commercial contracts signed—all on an unprecedented scale, and led by China, whose appetite for commodities seems insatiable. Do China’s grand designs promise the transformation,at last, of a star-crossed continent? Or merely its exploitation? Surely they can’t all be reading the paper and taking a nap? All joking aside, the cold reality is that foreign attempts to develop Africa have spectacularly failed. No one disputes that developmental polices have traditionally been short sighted. Nevertheless, development projects are only as good as the repairman has money, skills, ambition, a society that encourages entrepreneurship, and the will to see the service they manage succeed. The only people that can – and should – save Africa at the end of the day, are Africans. 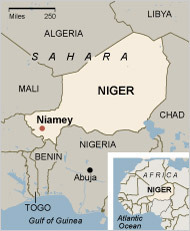 China deepens ties with Niger. NIAMEY, Niger — For China, the transition seems smooth. Just a few months ago, China was widely derided here as the financial backbone propping up an autocratic president, Mamadou Tandja, giving him the confidence to ignore international condemnation as he chopped away at Niger’s democratic institutions. “Our diplomatic relations with China were not affected by the coup d’état,” said Mahaman Laouali Dan Dah, a spokesman for the military junta now running the country. That was plain to see from the front page of the government newspaper this month. China’s ambassador to Niger, Xia Huang, was prominently shown inspecting the bridge that his country is building here in the capital. About 10 days before, Mr. Xia had proclaimed on state television that China’s extensive oil and uranium interests in Niger had not been “disrupted by the events” — the coup — in February, news agencies reported. Will most western countries would trend carefully after a military Junta overthrows a government, the Chinese simply don’t care. Neither does the Junta. The Nigeran junta knows who didn’t harshly critique what they were doing “in the name of democracy”. But the junta does not seem eager to upset the Chinese — “checking doesn’t mean calling into question,” said Col. Abdoulkarim Goukoye, a junta member — and for now China appears to be proceeding confidently, sealing its reputation here as the continent’s behind-the-scenes force, ready to do business regardless of who is in power or whatever outrage exists about it. But even Mr. Bazoum did not suggest breaking with China now. In a sign of how desperately Niger needs investment — the nation ranks at the very bottom of the United Nations human development index — Mr. Bazoum said he hoped the old deals would be respected, suggesting how quickly the looming backlash against China here has become an embrace. More good news about the prospects of economic growth in Africa. Africa weathered the storm better than in the past and previously thought. Sub-Saharan Africa is weathering the global financial crisis well and its recovery is expected to be stronger than after previous global downturns, the International Monetary Fund (IMF) said Wednesday. While some oil-exporting countries and middle-income nations had been hit hard by falling demand for their exports, the continent’s low level of integration into world markets meant that it had been relatively sheltered from the crisis, the IMF said in its semi-annual World Economic Outlook report. Furthermore, while Africa had feared a sharp fall-off in foreign aid and remittances from expatriate Africans as a result of the crisis, the decline had not been as severe as anticipated, the IMF found. That aid, twinned with improved government policies in many countries meant the downturn had a limited effect on some of the poorest countries. ‘Growth in a number of the more fragile economies even accelerated last year,’ the IMF noted. By contrast, middle-income economies that conduct a lot of trade with the rest of the world were among the hardest hit. South Africa’s Gross Domestic Product contracted by 1.8 per cent in 2009. The IMF has predicted 2 per cent growth for the continental powerhouse in 2010. Growth also slowed in oil-producing countries on the back of shrunken demand and prices for fuel, coming in at around 4 per cent. But the rebound in oil prices meant countries like Nigeria and Angola, Africa’s biggest producers, were headed for growth of about 6 per cent this year, the IMF said. One of the biggest threats to Africa was the tightening of foreign purse strings for development projects, the IMF warned. The IMF also cautioned that stronger oil prices, while benefiting producer countries, could cause inflation to spiral in others, and that donor aid might be further tightened as leading economies come under pressure to cut public spending. Political uncertainty also posed a threat to growth in some parts of Africa, particularly West Africa. After growing by 2 per cent in 2009, the continent as a whole will grow by 4 per cent in 2010, the IMF predicted, a forecast unchanged since last October. That compares with average growth rates for the region of about 6 per cent between 2004 and 2008. In 2011, the IMF expects the region to grow by 6 per cent. Bright days ahead for African agriculture? Africa joins Asia and the U.S. in passing the worst of the global economic crisis. The winds of economic dynamism seem to be blowing at the back of the African continent as a whole. That is according to William A. Masters, a professor of Agricultural Economics at Purdue University. After decades of bad news, at least three major trends are turning Africa’s way: agricultural policies, rural demography, and farm productivity all promise improved opportunities for farm families across the continent. These trends move too slowly to make headlines, but cumulatively they offer a whole new world of bigger payoffs from public and private investment in agriculture and rural development. Each country in every year faces a unique set of circumstances. Novelties get the most attention, like the possibility that outside investors might control large areas of farmland. Spatial diversity is also important, because it ensures that each place differs from the aggregate average. For Africa as a whole, however, at least three slow trends have recent turning points that offer game-changing new incentives for entrepreneurs and governments. The first turning point is political. New data from a World Bank study that compares farm policies around the world since 1955 shows for the first time just how far today’s African governments have gone to reduce the cost to farmers of the export taxes, marketing boards, and other interventions imposed by previous regimes (www.worldbank.org/agdistortions). Africa’s policy-induced price distortions peaked in the late 1970’s, and reforms since then have removed about two-thirds of that burden, greatly facilitating productivity growth and poverty alleviation. Further reforms could yield additional benefits, but much of the handicap imposed on African farmers by post-colonial governments has now been removed. The second transition is demographic. Census data compiled in recent revisions of United Nations population projections reveal the slowly unfolding implications of African history. African households obtained access to modern medicine much later and more suddenly than people in other regions. The resulting improvement in child survival rates and population growth during the 1970’s and 1980’s were faster than those seen earlier in Asia or Latin America. Africa’s towns and cities have been growing at some of the world’s fastest rates, but their absolute size is so small that they can absorb only a fraction of all new workers. Consequently, Africa’s rural population has been growing faster and for longer than any other in human history, with a correspondingly rapid and prolonged decline in per-capita endowments of land and other natural resources. Moreover, post-independence improvements in child survival triggered a rise in child dependency rates, which also reached historically unprecedented levels in the 1970’s and 1980’s. Africa’s demographic burdens began to lighten in the 1990’s, thanks to gradual reduction in fertility rates and continued urbanization. As seen earlier in Asia, the slowdown in rural population growth and the reduced burden of childcare creates a window of opportunity for new investment to bring larger year-on-year increases in output per capita. The third turning point in this sequence is technological: national estimates of cereal crop productivity show how, after decades of stagnation during the Asian green revolution, African yields have grown steadily over the past decade, so that estimated cereal grain output per capita now equals that of South Asia. The start of this turnaround could be associated with the other two trends, as the cumulative result of more favorable policies and increased labor per hectare, but it could also reflect the gradual spread of improved crop varieties that resulted from earlier investment in agricultural technology. The inflow of foreign aid to boost agricultural production did not rise until after the world food crisis of the 1970’s, and it peaked in the late 1980’s, yielding payoffs some years later. These challenges can be dealt with effectively with improvement in farm policy due to importation and implementation of technology. Land reform that has property rights as the main foundation to ownership and the rule of law, which is backed up with an independent and competent judiciary. Again this is no easy task, especially in places that might be war torn, but these policies will be the main driver of improvement in Africa’s agriculture. The U.S. and Nigeria seal cooperation agreement on stopping Nuclear proliferation. Nigeria and the United States have agreed to work together to counter the spread of nuclear weapons, a senior US official said after a weekend meeting with acting president Goodluck Jonathan. Undersecretary of state for political affairs William Burns met Jonathan late Saturday as the West leans on the UN Security Council — where Nigeria has a seat — to slap tougher sanctions on Iran over its nuclear programme. “The United States and Nigeria are determined to live up to our responsibility on nuclear issues,” Burns told Nigerian state radio after the meeting, which he described as “excellent”. Both nations would work together to “both reduce existing nuclear arsenal …and work against the proliferation of nuclear weapons,” he added. They will also “look for ways in which we can increase cooperation on civilian nuclear energy,” he added. Burns met Jonathan on the same day that Iranian President Mahmoud Ahmadinejad was in Kampala to lobby Uganda — the other African member of the Security Council — on the nuclear issue. Iran has previously offered to help Nigeria build a nuclear power plant. Iran faces new sanctions after it refused a nuclear fuel supply deal which would have sent its low-enriched uranium to Russia and France for conversion into high-grade uranium and later returned for its nuclear energy needs. Last weekend, Iran — which is defying previous UN demands to halt uranium enrichment, and which denies it is on a quest for a nuclear arsenal — said it would lobby all UN Security Council members against sanctions. Jonathan met US President Barack Obama a fortnight ago when he travelled to Washington on his first foreign trip for an international summit on nuclear security. Nigeria is the United States’ biggest trading partner in sub-Saharan Africa, with about a half of Nigerian crude oil production crossing the Atlantic to the US market. More in depth information on US-Nigeria relations can be found at US State Department site. African Union leaders meet US Security advisor. On Friday, leaders from the African Union where in Washington for some strategic meetings. Senior African Union officials met US National Security Advisor General Jim Jones at the White House to discuss increased cooperation between the United States and their organization. The AU delegation, led by chairperson Jean Ping, was on the last day of a three-day visit for the first high-level bilateral talks between the African Union and Washington on issues including fighting hunger, climate change, and boosting peacekeeping operations. Jones and Ping “both greatly appreciated the opportunity to meet and discuss shared challenges and opportunities in the areas of peace and security and economic development,” the White House said in a statement on Friday. Ping told reporters after the meeting that the AU’s 53 member states face issues “which are global problems, which can be solved only globally. “If you want to talk about climate change or trade, no single (African) country… could be heard. Its voice is too small to be heard individually,” Ping said. The AU delegation also met with senior officials in the State Department, the US Agency for International Development, the Department of Justice and others. Africa growth potential similiar to India? In Africa, Bharti Airtel Ltd. appears determined to wade into a market loaded with poverty, promise and major legal tussles—just like home in India. Bharti, headed by Indian billionaire Sunil Bharti Mittal, has seized on a potential $9 billion deal with Kuwait’s Zain, or Mobile Telecommunications Co., that, if completed, would catapult the company into the ranks of major telecom operators in Africa. Combined with operations in India, Bharti would have significant footholds in two continental markets. The deal would include the assumption of $1.7 billion in debt. 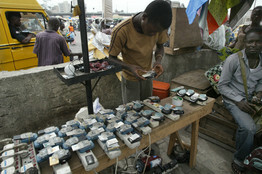 Associated Press Nigeria is Africa’s largest cellphone market. Above, a man uses a gasoline generator to charge mobile-phone batteries for a fee in Lagos. Bharti’s bid also comes at a time when new undersea cables are reaching Africa, connecting the continent to the rest of the world. “Zain’s operations in Africa will always be attractive because of their footprint there,” says Badii Kechiche, a senior analyst in London at Pyramid Research. The talks mark the third attempt by Bharti’s Mr. Mittal to gain a foothold in Africa, the world’s poorest continent but with a population of about one billion and home to several fast-moving economies. For global telecom companies, Africa offers strong growth potential. Cellphone penetration rates remain among the lowest anywhere. Zain has close to 42 million customers in the 15 countries the deal will include, with most markets having shown double-digit subscriber growth in recent years. There’s room to grow: Cellphone penetration in these markets averages less than 40%, according to data from industry researchers Onda Analytics. For Bharti, coming to Africa may seem like a coming home. Like Africa, India boasts high subscriber growth rates and large rural populations with little fixed-line infrastructure. There are common aspirations for owning a mobile phone, both as a tool for business and as a means to contact far-flung family members. And with growth has come aggressive competition. In another sizable market, Kenya, Zain has similarly hit competitive headwinds. In the third quarter of 2009, Zain’s market share was static at 17%.